Tired of "Wishing" You Could Achieve Great Things... Instead of Actually Achieving Them? The "Fire" You Need to Accomplish Anything - Even if You've Held Back for Years - is FINALLY at Your Fingertips! Think back over the last year for a minute. Think about all of the things you told yourself you were going to accomplish. Maybe you had planned to start a business (or two)... or finally achieve your income goals with your existing business. Well, you probably wanted to accomplish dozens of things. Maybe hundreds. But let me ask you... how many of those things did you make happen? If you're like most of us, you probably only achieved a small portion of what you thought last year you'd get done by now. Now... how does that make you feel? If you're feeling a bit embarrassed right now... don't worry. We all have a whole list of things we'd like to accomplish. And we tell ourselves we don't have the time... or the energy... or the opportunities. We tell ourselves that someone or something outside of ourselves is keeping us from grabbing onto what we really want (and what we truly deserve for ourselves). But the truth is... that really isn't it at all! So Why Don't Most People Achieve the Things They Really Deserve? Well, if outside forces aren't conspiring against you to keep you from fulfilling your own dreams... and if we can't blame a lack of time or energy... then what is it? Is it lack of ability? Is it some horrible personality defect? Nope... it isn't any of those things either. Simply put... it's a lack of motivation. ... well, that's incredibly hard for almost anyone. You see, we're not taught how to get motivated and stay motivated. It's not something you learn in grade school or even high school or college - our teachers and professors just don't focus on making sure we've mastered "motivation." In fact... the only "motivation" most of us are ever taught is the motivation to avoid punishment! But it doesn't matter how much talent you have... if you don't have the motivation, you're going to spend the rest of your life simply wishing that you could get your hands on what you want. And really... that's no way to live. But here's the thing... if you don't have the right tools and techniques available... getting the motivation you need can be all but impossible! It's not something you can manifest by sheer willpower alone (well, not for very long, anyway). And for you, that means that they're constantly giving you the old "dog and pony show"... but every time you fall for it, you find out at the end that there's no pony! I'm Dr. Steve G. Jones. You might say that empowering other humans is sort an obsession of mine. You see, I've spent more than 20 years helping people overcome fears and obstacles, banish self-doubt, and achieve things they thought were impossible through clinical hypnosis. I'm a board-certified hypnotherapist, and over the past 20+ years, I've written 22 books on a wide range of hypnotherapy and personal achievement topics. I regularly attend in-depth training and education conferences to stay on top of the latest breakthroughs in psychology, hypnotherapy, and related disciplines... all to help people achieve the greatest success possible. And I'm thrilled to have been able to help thousands of people through one-on-one hypnosis sessions. From tackling seemingly insurmountable goals to everyday things like quitting smoking and banishing depression, I'm helped my clients do it. And I've traveled the world, teaching others how to help their own clients with similar problems. You might not know that even Hollywood A-listers rely on hypnotherapists to help them with issues in (and outside of) their careers. I've worked with a long list of Hollywood directors, writers, producers, and yes, actors... many of whom have been coming to me for years! But here's the thing - as much as I love working with clients one on one, I realize that not everyone has the luxury of traveling to my California office to meet with me for hypnotherapy sessions. That would involve taking time off work or away from school or family... not to mention the incredible financial expense that people from other countries (and even across the United States) would incur. So I started looking for ways I could help people like you... without requiring an in-person meeting. I discovered that lack of motivation is a huge problem for millions of people around the world - talented, brilliant people just like you - and that by empowering you with the specific techniques to overcome obstacles to motivation, I could help you achieve virtually anything you could possible dream of. And by taking what I've learned over the last 20+ years and putting it into digital audio format, I knew I could help people like you skyrocket their motivation levels almost instantly... without having to wait for physical recordings to arrive or to see me in person. I put a tremendous amount of time, research, and organization into creating an in-depth, actionable course that would help anyone gain incredible motivation quickly... even if they had been struggling with motivation problems for years. Finally, though, I knew I had created a course that was easy to follow, and that was packed with tips, strategies and tools that people could start using right away... so that they could start seeing jaw-dropping results almost immediately. My friend... that's exactly what you're getting your hands on today! "101 Ways to Boost Motivation" is exactly what it sounds like... it's an in-depth course showing you exactly how to use 101 different tools, strategies, and techniques to enjoy motivation levels you never thought were possible. Each technique has been extensively tested, and has been proven to be effective for helping people accomplish more in less time... and making achievement fun! You'll get detailed explanations of each technique, so that you can start using them immediately to get more done and get more out of life. Unlike other motivational courses, which can last for weeks or months and take forever to get to the point... "101 Ways to Boost Motivation" gets you where you want to go fast... and because the modules are simple to follow and remember, learning these proven techniques seems almost effortless! Why am I Explaining 101 Different Tools and Techniques in This Course? I said a minute ago that each of the techniques have been extensively tested. So if that's the case, why would you need 101 of them? Shouldn't just one or two techniques be enough? Sure, it would seem that way. But the truth is, you'll gravitate toward some tools and techniques more than others. Motivation isn't "one size fits all." So I'm including a wide range of proven strategies that you can pick and choose from as you like. You're also going to find that some techniques work better for you when it comes to working toward certain goals. So having a wide range of strategies available gives you the flexibility to choose the best ones for any given situation! 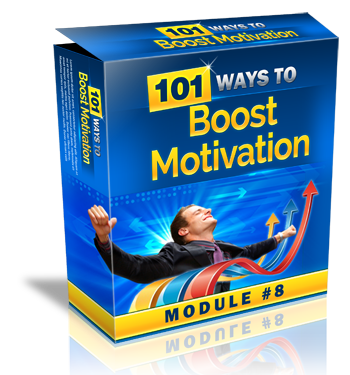 You're getting an 8-module audio training course designed specifically to give you the exact tools and strategies you need to amp up your motivation and achieve the extraordinary... even if you've struggled with a lack of motivation for years. Each of the 8 modules explains in detail the exact techniques that can dust off your motivation and have you achieving the accomplishments you truly deserve... starting now! Each audio comes in high-quality digital format, so you can take advantage of this training at home, at work, at school, or anywhere else! Simply access the audio modules on your desktop, laptop, smartphone, or tablet... and you can rev up your motivation any time you want! It would be almost impossible to "quickly" list every technique you're getting your hands on when you place your order just minutes from now. After all, you're getting the real-world benefits of my 20+ years of research, experience, and testing. What Makes "101 Ways to Boost Motivation" Different from Other Motivational Training? Quite simply, I've designed this training to kickstart your motivation as fast as possible without a lot of nonsense or "fluff." I know there are a lot of "gurus" out there that sell you on a bunch of "feel good" platitudes and empty theories. Sure, you'll feel like you're on top of the world for a few minutes... but as soon as you realize that nothing these guys have said will actually help you in the real world... you end up feeling even more frustrated and hopeless than before. My job here isn't to pump you full of "feel good" fluff and send you on your way. My job is to give you the easily understandable, repeatable, proven techniques you can immediately apply to crank up your motivation level and tackle any project with super-human focus and energy. But if you're tired of hearing all of the "rainbows and unicorns" stuff that doesn't actually apply to your life... and you want the real deal on how to crank up your motivation to peak levels (and keep it there)... this is the training you've been waiting for! Listen, when you see how little you're investing in this incredible, powerful training today, you're going to feel like you're getting an incredible deal. And to be honest, I have to agree. I know that even if I charged 5 times what you're paying right now, you'd still realize that the training is an amazing value. I personally guarantee that you're going to be blown away by the awesome power of "101 Ways to Boost Motivation." Just try out the motivation-cranking audio modules for 60 days risk-free. If you don't agree with me that the information and training in these audio modules is head and shoulders above any other motivational book, audio, seminar, or anything else you've ever tried... I insist that you email me within 60 days to tell me about it. Now, I'm sure that's not going to happen - after all, you're getting your hands on real-world motivational techniques that empower you achieve virtually any goal - but if it does, here's what's going to happen: I'll quickly refund every single penny of your investment in this course... no matter the reason! And I won't give you any hassle whatsoever about it - you'll just get your money back and we'll part as friends, okay? Now that you know you're taking on absolutely zero risk... what reason is there not to take advantage of the transformational power of "101 Ways to Boost Your Motivation?" There aren't any reasons that I can think of! The time has come to start getting what you really want out of life. And this is your chance to start making it happen... right now! Do yourself a favor and grab this chance before you let another opportunity pass you by! Don't Procrastinate - Get Your Hands on "101 Ways to Boost Motivation" and Start Achieving what You Truly Deserve Today! Right now, you have a decision to make. You can either continue to sit around and "wish" that you could get what you want out of life (even though you know that's never going to happen)... or you can take advantage of powerful, effortless training that will turbo-charge your motivation and enable you to not only reach your goals fast... but to achieve things that you'd never dreamed possible! Now, I know that there are a lot of motivational "gurus" out there who would charge you $499 or more to give you this information and training in digital format - that is, if they couldn't get you to pay $1,200 or more to get the same information in a live workshop! But frankly, I want anyone who has unmet goals to be able to take advantage of this training. I want you to be able to do more in less time... and with less effort... without having to pay hundreds of dollars for an audio course or thousands for a live event. So don't worry... I'm not going to ask you to invest anything close to $499 for this audio course. In fact, I'm not even going to ask you to invest $99 (although that would still be an amazing deal)! When I tell you that $7 is all you'll pay, I'm not kidding. There are no monthly subscription fees or any of that other nonsense. You'll have full access to every single one of the modules for life... and you'll never have to invest another penny! And When You Place Your Order Today... I'm Throwing in this Valuable Bonus! I understand that, although the in-depth audio modules are quite convenient for learning effective motivational techniques and strategies at home or on the go, there might be times when you need to revisit a specific motivational technique quickly. And finding specific material in an audio module can be difficult and time-consuming. So I've gone to the time and expense of having the entire "101 Ways to Boost Motivation" program transcribed into text format - and I'm giving you the complete transcription at no extra cost. Every word of each of the 8 modules is right there at your fingertips, so you'll never be at a loss when you need to brush up on a specific motivational technique. Feel free to print out the transcript if you'd like - you can keep it on your desk for easy reference or take it with you to study when listening to the audio modules isn't an option. Eventually, I'm planning on charging at least another $17 for the transcription... but as my personal "thank you" for placing your order now, I'm giving you the transcription absolutely free! I can't say how long I'll be offering this bonus... so if you don't want to miss out on your chance to get all 8 of the audio modules and full transcriptions of each module for one low price... you need to act today! I look forward to helping you achieve the incredible accomplishments that I know you deserve! P.S. : You could easily spend much more on one of those "self help" courses that the "gurus" sell than you're investing in this transformative training today... and still not get even a tiny fraction of the valuable training you're taking advantage of here! Isn't having the power to finally enjoy the life of your dreams worth investing a measly $7? Of course it is! Do yourself a favor and claim your copy of "101 Ways to Boost Motivation" today! P.P.S. : I really would love to keep the price of this course at $7 forever. But the truth is, the more people I have tapping into the raw power of these audio training modules, the higher my server and maintenance costs go. So at some point soon, I'm going to have no choice but to substantially raise the price. But right now, you can avoid the price increase by locking in your order. Don't risk paying more later... click the button below and order "101 Ways to Boost Motivation" now!